Georgia has a very liberal visa policy. Citizens of most countries do not require visas for a stay of up to 360 days and citizens of Russia, Belarus, Ukraine and Iran up to 90 days. Other nationals may purchase visa upon arrival. For specific visa information for your country check here or here. Georgia is undoubtedly one of the easiest countries to hitch-hike. 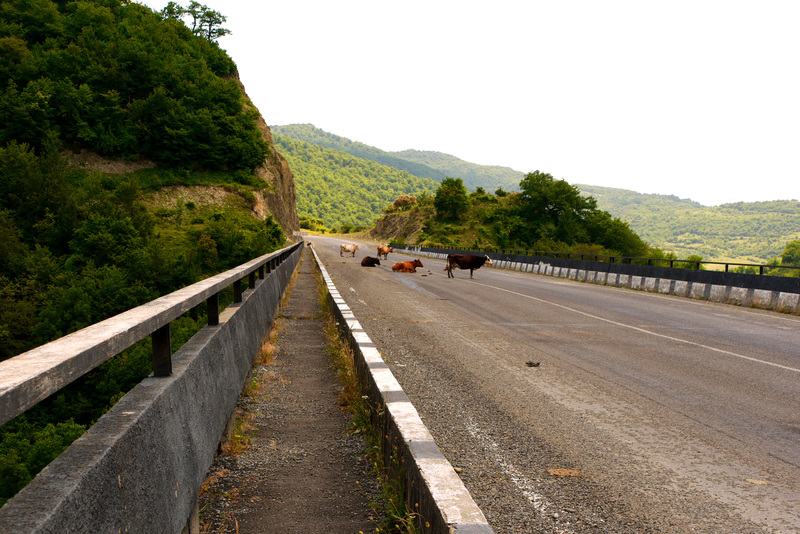 There are scarcely any motorways (just around Tbilisi), on which people stop anyway. The concept of hitch-hiking is well known and it’s also sometimes practiced by locals, especially those living in remote mountainous villages. Georgian people are EXTREMELY friendly and hospitable, and held us in awe every time they stopped for us by offering us not only the lift, but also meals, drinks and even ice cream. Besides that, in Georgia you stand the chance of communicating in English and if that fails, the majority of Georgians speak Russian like natives. It’s a pleasure to visit and hitch-hike in this beautiful country, admiring its various landscapes, as in Georgia you can find many different forms of terrain, beginning with high mountains, highlands and plains, and finishing with beaches on its stunning Black Sea coast. Georgia is such a pleasant and problem-free country to visit and hitch-hike that it’s really hard to find any disadvantages. 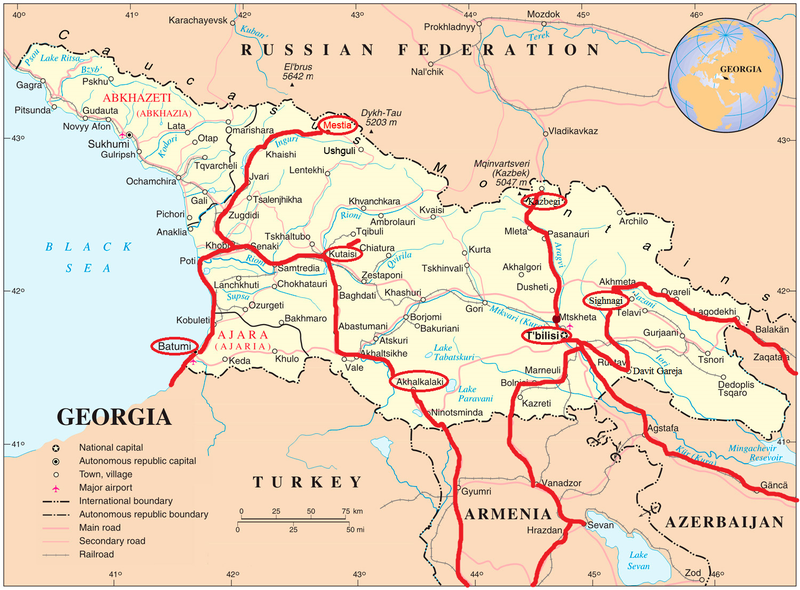 The only minor inconvenience is the fact that the Georgian-South Ossetian borders are closed to third party citizens. 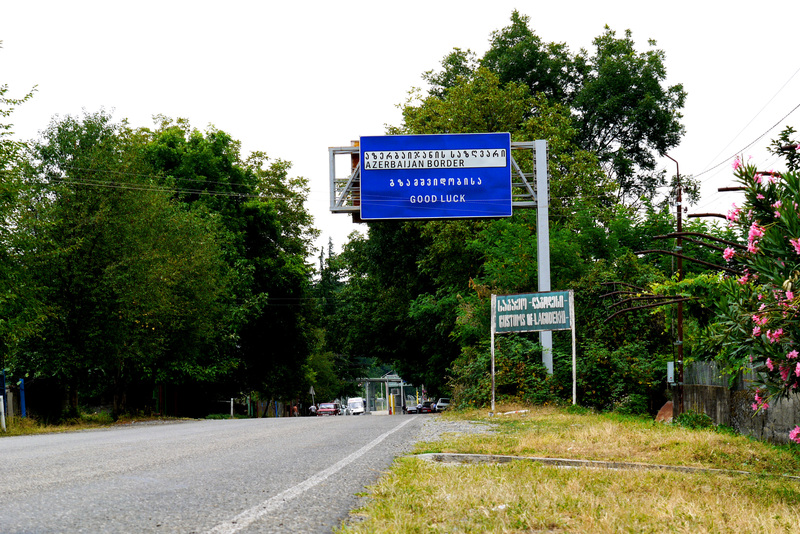 You might be able to cross the Georgian-Abkhazian border at Inguri (if you call the Abkhaz Ministry of Foreign Affairs and prepare all the necessary paperwork in advance; be warned, speaking Russian is a must. Check here how it works, but you might have problems crossing back to Georgia, because according to Georgians it’s illegal to cross this border. So your wanderings in Georgia are limited to crossing Azerbaijani, Armenian or Turkish borders, which is still better than in any other country in the region. Another slight disadvantage could be the lack of widespread couchsurfing. We only managed to find hosts only in Tbilisi, Kutaisi and Akhalkalaki. If you don’t manage to couchsurf, don’t worry; as in Armenia there are plenty of homestays in all parts of the country to choose from. They are a sort of unlicensed guesthouse run by local families, who offer paid accommodation under their roof. In most cases they also provide food (at least one meal a day), which is a huge advantage, since there aren’t many restaurants outside the cities. The best way to find a homestay (as they don’t advertise) is just to walk the streets looking lost. You will be quickly spotted by a friend of a friend of someone who runs a homestay, so just let yourself be found and they will do the rest. In the Caucasus this form of accommodation is the cheapest and provides the most authentic sort of experience. Speaking Russian helps (as English is rare in these parts), but it’s not essential. It’s also a good idea to have a tent if you decide to travel of the beaten track in Georgia. There aren’t that many other options outside big cities, apart from homestays and the odd Soviet era hotel. Bear in mind that some roads in Georgia are in a very bad state or are in the process of being built. 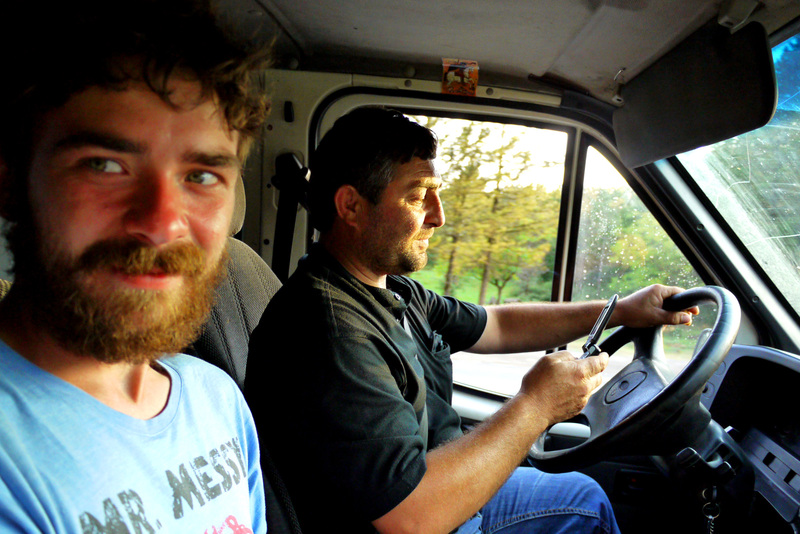 During our trip in 2011 the road from Zugdidi to Mestia was under construction and it took us a good six hours to travel the 130 km distance. The road wound round a mountain-side and it was the only way to get to Mestia, so even though the road was under heavy construction, it remained open. Sometimes we had to wait for the massive bulldozers and lorries to do their job and sometimes it just took ages to drive through the dusty two metre-deep holes full of rock and tree rubble. 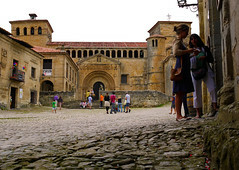 You should also keep in mind that Georgian currency cannot be exchanged in any surrounding state, so either spend all your laris within the country or pray that you meet other backpackers on the way who would be kind enough to cut you a deal. Driver: Ааа …. из Польши! (Aaah… from Poland!) which was usually followed by naming everything they knew about Poland (forgetting about England completely); starting with Lech Kaczyński, Poland’s ex-president who died in a plane crash in Russia and insinuating by the driver that Russians must have had a hand in it (Русские убили Качинского!). What’s more, the majority of backpackers and hitch-hikers that you will meet in Georgia are bound to be Polish (don’t ask me why). I’m not sure if this information is of any help, but good to know. – friend – друг (droogh) (very useful when they ask you where you’re staying. The concept of Couchsurfing is often too difficult to explain, so just say you’re staying with a friend. You can also use this word to express the relationship between you and your fellow travelers). 1) Sarp/Sarpi (with Turkey)– it’s the main land border crossing between Turkey and Georgia, located about 12 km south of Batumi, Georgia and about 20 km northeast of Hopa, Turkey. There is no public transport going from the border crossing to Hopa (Turkey), however it’s possible to get a cheap local bus going the other way to/from Batumi (Georgia). 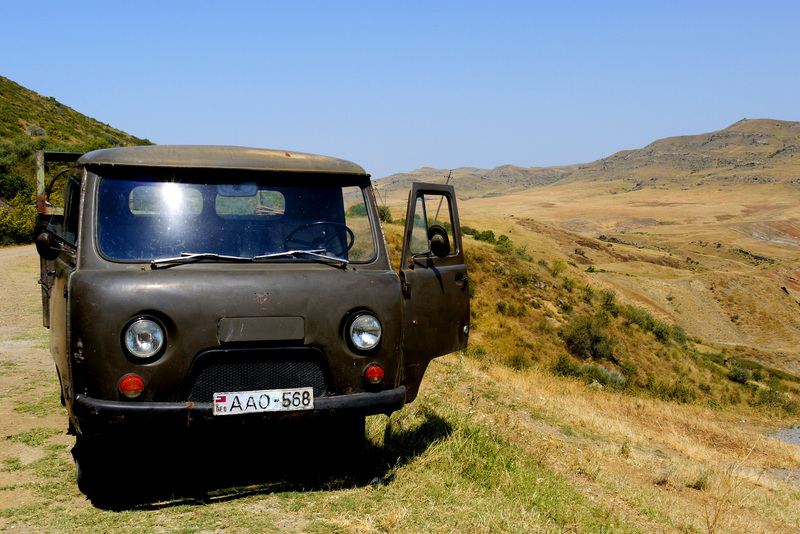 2) Sadakhlo/Bagratashen (with Armenia) – it’s a pretty pleasant and hitchhiker-friendly border crossing. Crossing on foot is problem-free and the border is located on the European route E001. 3) Bavra (with Armenia) – It’s the second border crossing with Armenia we used on our way back and it was also hassle-free. It’s located on the European route E691. 4) Matsimi (with Azerbaijan) – This border crossing is located on the road M5 between Telavi (Georgia) and Şəki (Azerbaijan). It was pretty easy to cross on foot especially after meeting an Azeri customs officer who had done his training in Poland and therefore spoke a bit of Polish. Speaking the same language always breaks ice between people, even during such scary experiences as crossing borders. Caution! If you want to enter Azerbaijan, you have to organize your visa in advance. 5) Böyük Kǝsik (with Azerbaijan) – It’s a rail border crossing, which you can use if you are travelling on a train between Tbilisi and Baku. 6) Lars-Kazbegi (with Russia) – This border crossing is located on the Georgian Military Road. We haven’t used it, as during the time of our visit it was still closed, but other travellers have confirmed that it’s been reopened for third party citizens. 7) The border crossing South Ossetia is closed for third party citizens. 8) For information about the border crossing with Abkhazia go here. There are no bad areas for hitch-hiking in Georgia, as the whole country is immensely beautiful and in all its parts people are friendly and won’t refuse you a lift. However, we would definitely recommend travelling along the Georgian Military Road (Georgian: საქართველოს სამხედრო გზა [sakartvelos samkhedro gza], Russian: Военно-Грузинская дорога [Voyenno-Gruzinskaya daroga]). 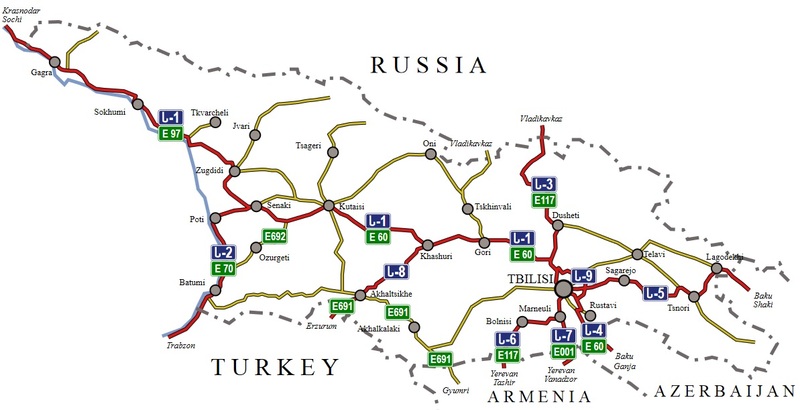 It’s the main Caucasus road connecting the Caucasus (it goes straight from Tbilisi) and Russia (Vladikavkaz). 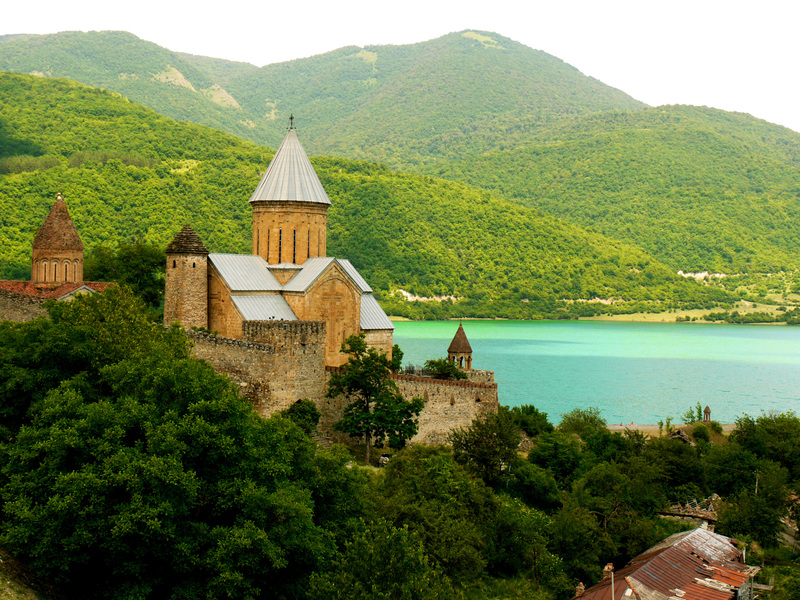 The first spectacular spot en route is the turquoise Zhinvali Reservoir, with Ananuri fortress on its western bank. As the road continues, it becomes less populated, scarcely dotted with settlements. Here there’s no more asphalt and the artery turns into a grit road. You go through some dramatic green valleys to enter the proper rugged Caucasus where your nostrils become full of brisk mountainous air and your ears slowly become accustomed to the change of height. The road winds on mountain sides and you only pray that the Lada that picked you up will manage the task, rather than topple and fall down the precipice with a thud that breaks the silence. The savage scenery here is mixed with colossal concrete abandoned edifices, remnants of the Soviet era that back in the day probably served in local wars. It’s hard to drive in this challenging mountainous terrain, so it takes a while, but eventually you get to your destination where moody Kazbegi mountain commands respect. 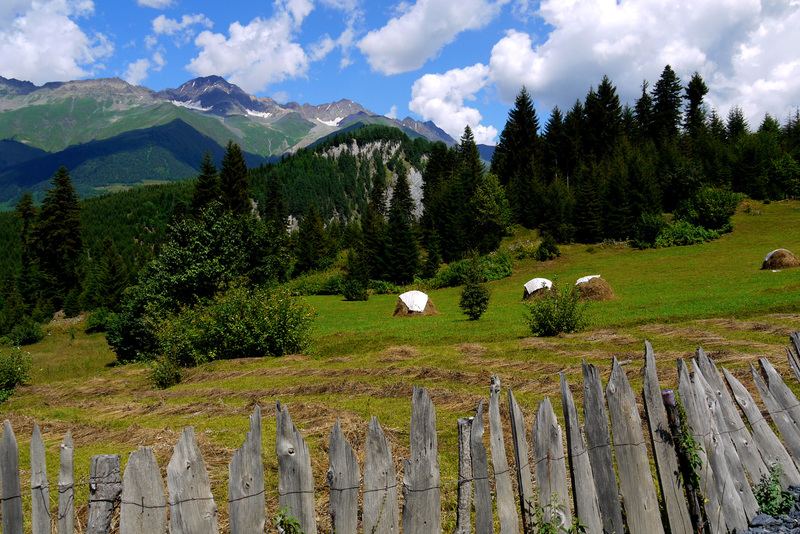 As I said before, there are no ugly places in Georgia, but the most beautiful of them all is probably Svaneti region. 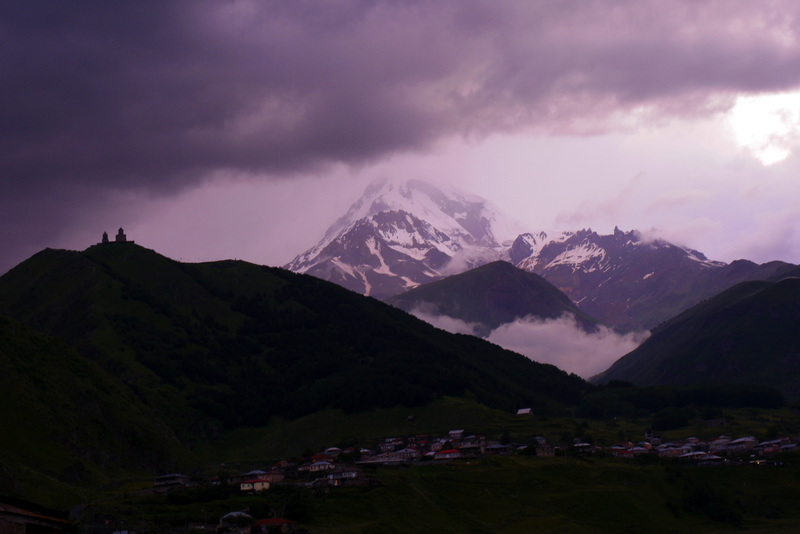 It’s surrounded by 3000-5000 metres peaks and it’s the highest inhabited area in the whole Caucasus. There are also more hikes than in Kazbegi region, so if you came to Georgian in order to stretch your legs, that’s the place to go. 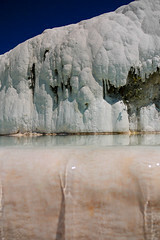 The landscape in this region is dominated by high mountains which are separated by dramatic gorges. The main town in this area is Mestia, which during our trip was extremely hard to get to, due to the heavy road construction. 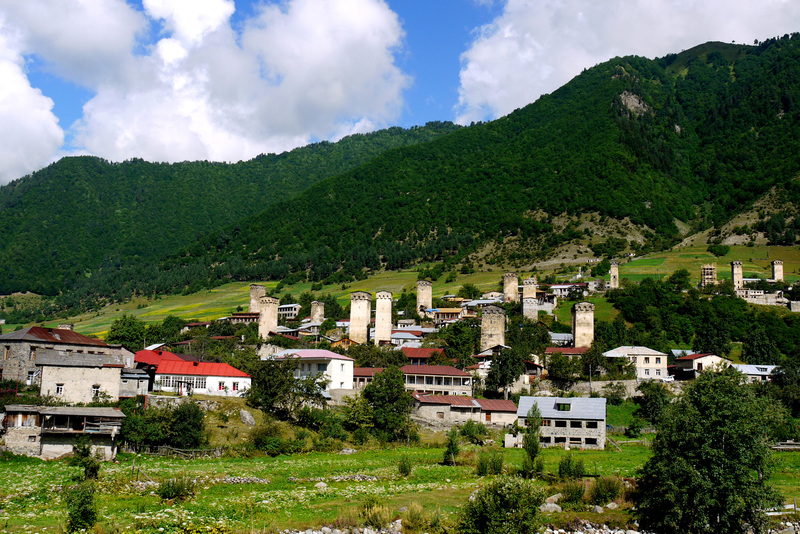 The town is located at an elevation of 1500m and it’s abundant of tall stone towers (“Svan towers”). Traditionally all Svan fmailies (which is a local tribe in this region) possessed a towed in order to protect themselves not only from avalanches but also from vendetta that could be waged by fellow Svans. This tradition had been present in this region up until 2004/2006 when Mikheil Saakashvili cracked down on this “barbaric” practice. 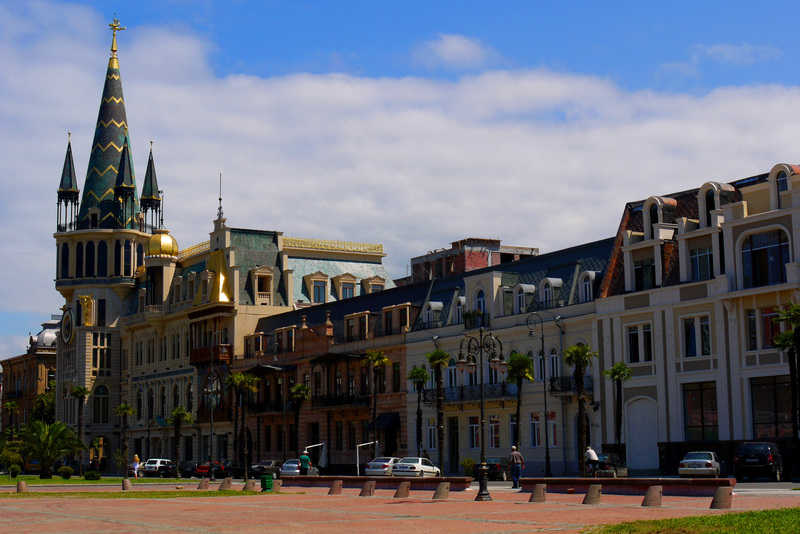 I never thought I would say so, considering that I’m not really a beach person, but the best Georgian city/town is, in my opinion, Batumi. This city where Stalin used to live 16 years prior the Russian Revolution, is located on the Black Sea coast and it hasn’t lost any of its grandeur. It’s still Georgia’s summer capital, probably partly due to its semitropical coast, and partly because of its charming fin-de-siècle architecture mixed with some modern glass-and-steel constructions. In the summer it’s packed with Georgian, Russian and Ukrainian tourists and its buzzing nightlife is unique in the whole Caucasus. It’s also the most “western” city, so here you’re most likely to feel at home. It’s hard to couchsurf in Batumi, due to the fact that here everything revolves around tourism and the majority of locals are somehow connected to it, but don’t worry, there are plenty of hostels to choose from. We hitch-hiked in Georgia in 2011 during our Caucasus-Turkey-Greece trip. We crossed Georgian borders 6 times, as due to the political situation in the region it served us as a transition hub between countries which don’t hold friendly relations with each other. We stayed in the country around 3 weeks and we covered 1504 km by hitch-hiking. This entry was posted in *Guides*, Caucasus, Turkey and Greece Hitchhiking Trip 2011, Country guides, Georgia and tagged backpacking, border crossing, Caucasus, Georgia, guide, hitch-hiking, map, route, travel, visa. Bookmark the permalink. Świetny przewodnik. Ciekawe opisy i bardzo przydatne rady dla podróżujących. cool! you should definitely go to Georgia, one of the nicest countries we’ve ever been to! good luck! Thanks for stopping by and for your kind comment, Tom! You can get in touch with us using the contact form in “Contact us”. We’d be glad to be of any help to you.